74" long seat belt in black. A very good safety item that really should be installed in all cars and trucks. Price is for one seat belt assembly. Belts include mounting hardware. Made in USA. 74" long seat belt in light grey. A very good safety item that really should be installed in all cars and trucks. Price is for one seat belt assembly. Belts include mounting hardware. Made in USA. 74" long seat belt in tan. A very good safety item that really should be installed in all cars and trucks. Price is for one seat belt assembly. Belts include mounting hardware. Made in USA. Seat adjuster bolt/nut assembly. This style was used on the 29-31 Murray 4-doors to adjust the front seat. Used on the 155-A/C, and 165-A/C. 19-1/16" long. Made in USA. 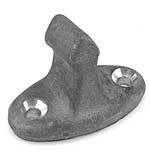 Used with the A-63534-AR seat adjuster bolt. It is the rear bracket under the seat frame that the long rod sets in that adjusts the seat. It attaches to the bottom of the wood seat frame bracket. Made in USA. Seat adjuster bolt for the 1930-31 Model A Ford. The special threaded bolt that adjusts the screw type adjustable seat. The seat adjusting knob fits on the end of this. Made in USA. Seat adjuster nut 1930-31. Special round nut that is caged in the metal bracket on the seat assembly. Used only on the threaded style seat adjuster unit. Made in USA. Seat adjust washer, used on the screw style seat adjuster. Slides down on head of seat add. bolt before going through bracket at the front of the seat. The original was brass, but this is a nylon for smoother operation. Made in USA. This knob is for the adjustment on the front seat. Its fits the 1929-31 4-doors, and the early 1930-31 Coupes. Chrome plated. Seat handle screw for the 1928-31 Model A Ford. This screw holds the round style seat adjust knob onto the seat adj. bolt. Made in USA. Seat adjust handle for the 1930-31 Model A Ford. This style of handle was used on the 30-1 Victoria, and the Slant Windshield 4-drs. Chrome finish. Seat adjuster bracket 1930-31. The front bracket that retains the seat adjuster bolt. Used on several body styles. Plain finish. Made in USA. Screw Type Seat adjuster bracket that mounts to the seat riser with A-47832-N installed. For the screw type seat adjuster. Made in USA. This clip screws to the backrest wood and is what the seat back hangs on. Used on all 1928-29 Coupes. 2 are needed per car. Made in USA. This is the saw-toothed style seat adjuster with the bracket that mounts to the front of the seat unit. Does not come with bracket that mounts to floor. Used on Deluxe 2-Door Sedans, Deluxe Coupes, Vicky, A-400, Cabriolets, Slant Windshield 4-door. and Deluxe Phaeton. Made in USA. Seat adjuster spring for the 1931 Model A Ford. This spring is about 6" long and is used on the seat adjuster of cars with the 'saw tooth' style adjuster. Made in USA. Seat latch assembly for the 1931 Model A Ford. This bracket mounts to the floor under the seat for the saw-tooth style seat adjuster to latch onto. Used on Deluxe Tudor Sedan, Late Deluxe Coupe, Victoria, A-400, Cabriolet, and Slant Windshield 4-doors. Made in USA. Seat spring clip for the 1931 Model A. This little bracket was screwed on the back edge (bottom) of the Victoria and Deluxe Tudor Sedan front seat assemblies. It was a place for the carriage return spring to pull. (sawtooth style) Made in USA. Support stud for the 1930-31 Model A. Supports the back edge of the bucket style seats that were used on Victoria, Deluxe Phaeton, and A400. Made in USA. Seat mouting bracket for the early Victorias. The Seat hinge goes through this 3 hole bracket to adjust the early adjustable seats. Both the drivers and passenger side used them. 4 required. Made in USA. Seat hinge channel for the 1930-31 Model A. This bolts to the seat wood and is about 12" long with a hole in it for the seat hinge rod (A-70145) to pass through. For Victoria & Deluxe Phaeton. Made in USA. 1930-31 Seat hinge channel reinforcement. This goes on top of the wood above the A-70144 hinge channel to reinforce it to the wood seat. Victoria & Deluxe Phaeton. Made in USA. Rear seat male catch for the 1930-31 Model A. This bolts to the back of the back seat backrest to attach it to the back of the car on all Victorias, A-400, and Deluxe Phaeton. Made in USA. Seat leg, mounts to floor of Model A Tudor Sedans. The front bucket seats pivot on these brackets. Made in USA. Offset seat legs for the front edge of the Tudor Sedan front seats. These have a 2" offset in them to give you more legroom. Set of 2. Made in USA. Seat hardware kit for the 1928-31 Tudor Sedan. The pivot brackets and the seat cups for the Tudor Sedan seat assembly. One kit does one bucket seat. Made in USA. Seat rest cup 3/4" tall for the rear of the front bucket seat assembly. Available in two different heights so you can seat the seat position to your liking. Sold each. Made in USA. 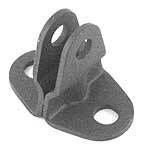 Seat rest cup 1-1/4" tall for the rear of the front bucket seat assembly. Seat adjuster kit for the 1928-31 Model A Ford Tudor Sedan. This kit replaces the front seat legs on the Tudor Sedan seats and makes the seat adjustable. Adjusts forward and backward as well as up and down. One kit does one seat. Made in USA. Seat tacking strip for the 1928-31 Model A Ford tudor sedan. This strip of wood is riveted onto the backrest framework of the Tudor Sedan front bucket seat assembly. Tacks to hold the upholstery in place are driven into this wood strip. Comes with mounting rivets. Made in USA. This steel grommet goes under the bucket seats on the hard board panel, on the Deluxe Phaeton and A-400. Made in USA. Seat peg for the 1928-31 Model A Ford. Used on various different body styles, this peg locates the seat cushion. Normally 2 were used per cushion. Sold each. Made in USA. This is the seat track assembly for the 1930-31 Model A Coupes. Made in USA. The seat stop block attaches to bottom of wood that cushion spring is upholstered to. When spring is slid into position, this block sets just behind front edge of seat riser to keep cushion in place. Used on 1928-29 Coupe, & several 2-door and 4-door rear cushions. Used 2 per cushion. Sold each. Made in USA. Sear track kit for the 1930-34 Four Door sedan. These are the ones that have the 4 seat studs. This is a set of the special clips that attach to the seat back wood of the 1928-29 Model A Ford Roadster that hold the seat spring on. Made in USA. 1931 Slant Windshield Model A Ford backrest clip set. These fasten the bottom of the rear backrest in place. They attach to the body using the same bolts that bolt the rear center body section in place towards the bottom. Used on sland windshield 4-door sedans. Set of 2. Made in USA. This is a set of 4 metal brackets that attach the top of the rear backrest to the body. Used only on 1931 slant windshield 4-door. Made in USA. Armrest kit for the 1928-34 Fords. This armrest was used on the sides of the back seat of 4-door Sedans and Victorias. One kit does both sides. Seat swivel bracket for the passenger side seat of Victorias, A400's and late 1931 Tudors. Set of 2. Made in USA.